Theme: Introducing how we, husband and wife, split the chores! 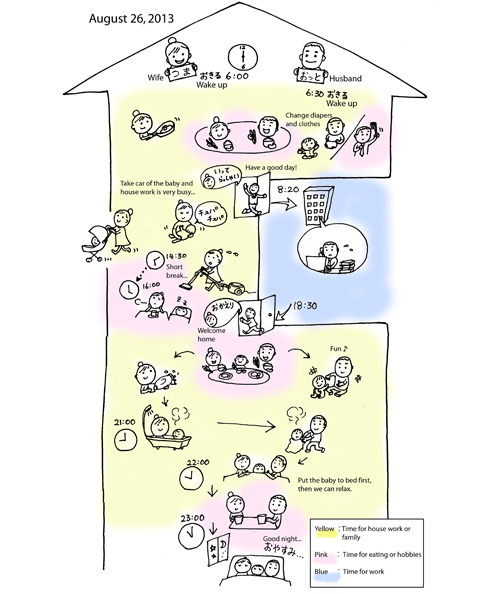 When at home, take care of the baby as much as possible. told us about the division of roles with his wife. I live with my wife and daughter of 5 months. My wife doesn't have a job, so she does the cooking, cleaning, washing, and other things around the house for us. When we got married, my wife was working and was very busy, so I also did some of the cooking, cleaning, and even the ironing. My wife likes cooking and cleaning, so even if I did things, they're different than the way she does things, and so she always bothered by it. Now, the household chores are my wife's role. When my daughter gets a little bigger and no longer needs to be breast-fed, I want to make some time for my wife to relax on her own. It's because every day, she's doing the housework and taking care of our daughter. I'm excited just thinking about a date with just me and my daughter. My husband does the cooking and laundry, and sometimes the cleaning too. He is better at making pasta than I am! No matter the result, don't complain about it!! 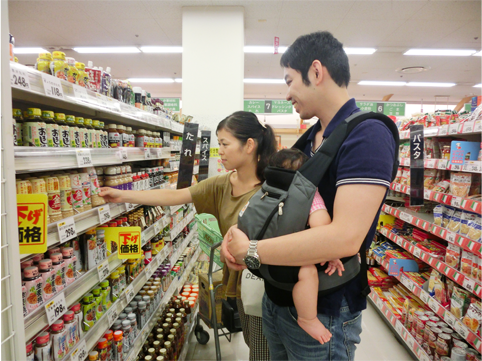 On weekends, we go to the supermarket together as a family. We buy a week's worth of groceries and things like that have run out. I also go to the supermarket and buy everything on weekends! Shopping as a happy family! Nice! My wife makes us food. On this day, she's making a root vegetable hamburg steak, with fish teriyaki and a salad. She thinks of a healthy, nutritiously balanced meal for us every day. Please teach me an easy recipe that has a good nutritional balance! Since my daughter became 5 months old, we read picture books to her every day. The time I can spend with my daughter every day is limited, so it's very important to me. It's exciting waiting for her to start speaking! Around this age is nice, I think! Recently, we went on a shrine visit near my wife's parent's house. We wished for our daughter to be raised happily and healthily. 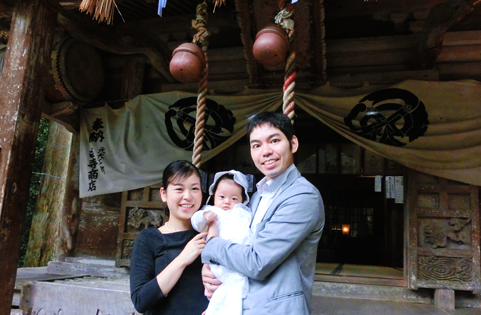 I went on a shrine visit when my daughter was born too. Nostalgic～! We spent August 26th, 2013 like this!